A Ponoka high school teacher has been named A Better World Canada’s 2019 Citizen of the Year. Julie Lapointe, who has taught Grade 11 and 12 biology and chemistry at Ponoka Secondary Campus for the past five years, has been a budding humanitarian since growing up in Sylvan Lake. In 2006, Lapointe travelled with A Better World to Kenya with her mother. Two years later, she started a fundraising campaign for the central Alberta-based international development organization. While attending H.J. Cody School, she helped raise money for a new school project, as well as the surrounding community, in Kenya. In 2009, Lapointe led a trip with classmates, teachers, the school’s principal and family members to take part in the grand opening of Kiprengwe Primary School. 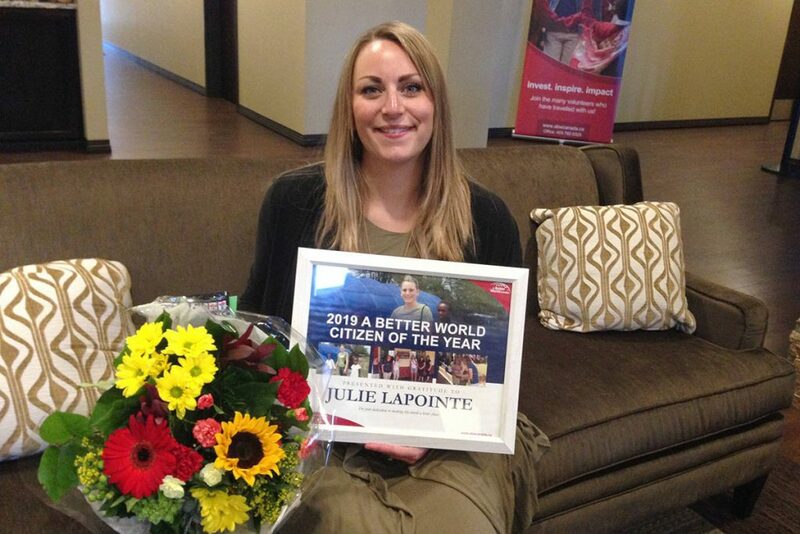 Now 27 years old, Lapointe continues her humanitarian efforts. This past Friday, she and her students raised $3,700 for water projects for a school. She also organizes an annual project with her family – the latest project was to raise money for 87 new pairs of shoes for people in Kenya. Recipients included a mentally challenged boy and a 100-year-old woman; neither had owned shoes before. Students at the Ponoka school have raised an estimated $9,000 for A Better World projects under the direction of Lapointe. Lapointe said she was “super humbled” to be named the citizen of the year, adding supporters of the charity don’t do it for the recognition. A Better World co-founder Eric Rajah presented Lapointe with the 2019 honour at the organization’s 29th anniversary celebration in Lacombe on Sunday. “Julie is never finished with making the world a better place,” said Rajah.